The Pure Whisky and Music festival is one of the best whisky festivals I have ever worked at or had the pleasure of attending. Organised by the fantastic folks behind Connosr, this festival was simple, but effective. 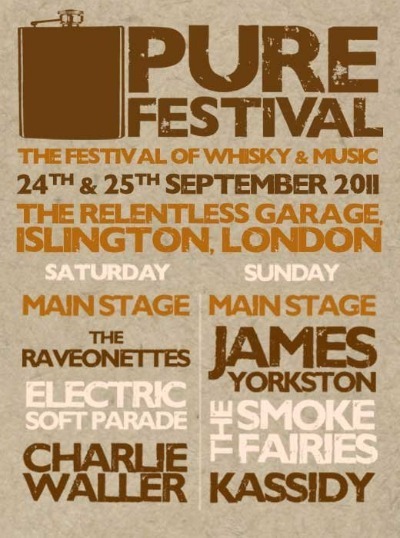 Cool venue: Relentless Garage in Islington, 10 different Whisky stands, a chocolate stand and loads of cool bands. These elements meant that the festival goers had brilliant time (I reckon there must have been over 800 people across the 2 days). From my own point of view, I had a blast. Some of the bands were really good, everyone was really friendly, I had a few drinks and spent some time with some friends I hadn’t seen in a while. And met some new friends too. For the Whisky brands that attended, this festival was worth its weight in gold and they should be fighting to take part next year. What’s in it for the brands that attend? The room was pretty much 50/50 men to women. This is important, since at other whisky festivals, the ratio is more like 80/20 men to women. Whisky companies want to reach out to female drinkers. It was great to see so many women there. The whole concept made the whisky so much cooler and far less stuffy. People didn’t feel intimidated. The attendees were inquisitive and honest. They said if they liked something and if they didn’t. They asked questions and listened to the answers. They were new to whisky, and wanted to know lots and lots about it. Afterwards, for the people manning the stands, there was a chance to interact with some of the festival folks. It gave us a chance to have a pint and a chat while watching the bands and being off duty. There is one huge thing I have left out that adds so much value to this festival, both from the organisers’ point of view and for a brand involved. 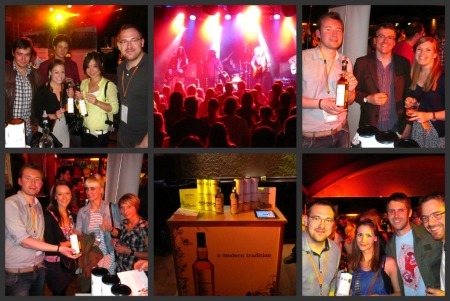 The organisers spent each day interviewing bands as they were tasting different whiskies. This is marketing gold for brands. They also interviewed most of the brand reps there. This is all content to advertise their event for next year, but is also very useful for whisky companies and for their marketing bods. It makes their brand look cool and the word gets spread online, as the photos and videos get posted online. This is where marketing budgets get spent these days. Overall: I can’t wait for next year! I will book four days in London, so I can properly enjoy it. Ardbeg: The stand was brilliant . Bails of hay, peat, edible peat. It really explained much of the whisky process just using props, but… not sure about the lasses in denim shorts. Definitely bring the lasses along next year. They were very friendly, and good chat, but tiny denim dungarees/shorts? I would be interested in other people’s take on this, but I get the feeling this may be a bit off putting to female drinkers. I could be wrong, but I think it would be worth looking into. In my opinion, they would have been better just in Ardbeg branded gear or just in whatever they want to wear. Lucas and I wore shirts and jeans. It suited the occasion. For me, the tiny denim shorts lacked imagination. Get Ardbeg Branded suits, or kilts, or dresses. Something stylish, with a hidden Ardbeg logo. Something that looks good and not tacky. The Whisky Exchange: Please please bring along some more of your bottlings next year. Port Askaig, for instance, is an awesome bottling and the crowd would have really enjoyed it. This entry was posted	on Friday, October 21st, 2011 at 10:36 am	and is filed under Events. You can follow any responses to this entry through the RSS 2.0 feed. Responses are currently closed, but you can trackback from your own site.